The best way to brave the cold of a German winter is, naturally, with a bit of warm spiced booze. That's probably why the majority of vendors to be found an a traditional German "Weihnachtsmarkt" serve up various steaming spiced alcoholic drinks. Glühwein is the most commonly consumed drink by visitors of German Christmas markets. It is usually prepared from red wine (and sometimes white), heated and spiced with cinnamon sticks, vanilla pods, cloves, citrus and sugar. Fruit wines such as blueberry (heidelbeer) wine and cherry (kirsch) wine are used instead of grape wine in Germany. Glühwein is drunk on its own or "mit Schuss" (with a shot), which means there is some extra liqueur, usually rum, added. Those looking for a bit of extra excitement opt for the variation described below. 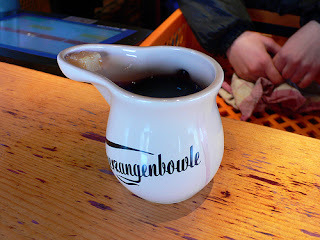 Feuerzangenbowle is a traditional German alcoholic drink for which a rum-soaked sugarloaf is set on fire and drips into mulled wine. The name translates literally to fire-tongs punch. Feuerzangenbowle is prepared in a bowl, the bowl is filled with glühwein. A sugar-cube or the more traditional Zuckerhut (sugarloaf or literally "sugar hat") is placed in a position above the drink, suspended on tongs, or more commonly at Christmas markets, on a specially designed platform in the bowl. The sugar is soaked with rum and set alight, melting and caramelizing. More rum is poured with a ladle until all the sugar has melted and mixed with the wine. Warmer Apfelkuchen is delicious and realively contemporary addition to the Christmas market's expanding drink selection; Warmer Apfelkuchen translates to "warm apple pie". It consists of mostly Mulled Cider, which is essentially spiced and heated apple juice, a traditional and tasty seasonal drink that is usually non-alcoholic. With the addition of a liberal amount of Zubrovka bison-grass vodka (a sweet Polish vodka with a flavour similar to apple) the beverage becomes a Warmer Apfelkuchen. Warmer Met ("warm mead" in English), is an alcoholic beverage that is produced by fermenting a solution of honey and water. Mead is similar in taste and alcohol content to White wine. During the Christmas season mulled mead, flavored with spices (and sometimes various fruits) and warmed, is available at a Christmas markets across Germany.